I firmly believe that anyone can learn how to crochet. I've taught my family members, friends, my local 4H group, and pretty much anyone who asks me. It's an incredibly rewarding experience for both teacher and student. However, being a good teacher and a good crocheter are two entirely different skill sets. (Skills that apply to pretty much any craft, not just crochet.) There are SO many things I wish I'd known but fortunately, you can learn from my experience. 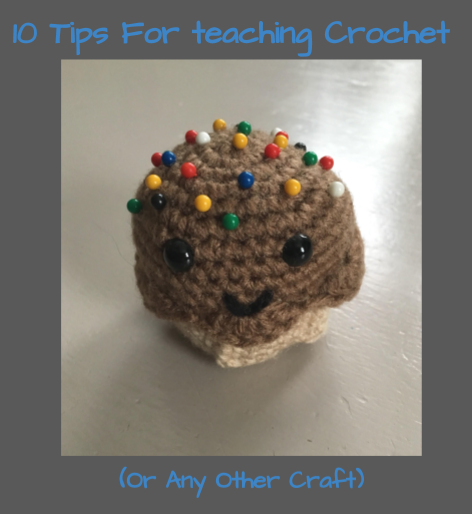 Whether you're trying to teach a large group or one-on-one, here are my top 10 tips for teaching crochet. 1. Nobody is a super crochet lady (or dude) right away. I was reminded of this a few days ago when I asked my mom for help with a knitting project. When we looked at my little swatch, we each saw something different. She noticed each individual stitch, increase, and even the slant of each stitch. Me? I just saw a swatch of something that was (probably) knitting. It takes years to learn that stuff. Be patient will your student and remind them to be patient with themselves. 2. Have multiple methods for each technique. Although it's not always possible, it's incredibly helpful. Show different ways to hold the yarn/hook, start a circle, make a slipknot, etc. Remember: the important part is not the method but the finished product. 3. Go slowly and repeat steps as necessary. When I was learning to sew, I was taught by a large group of super-sewing ladies. They all went very fast through the steps without explaining what or why they did what they did. It was frustrating to see them whip through steps even after I asked them to slow down. It's actually one of the reasons I didn't pursue sewing. Going slow enough and making sure your student understands can be the difference between them loving or hating the craft. 4. Use a bright, single-colored, non-fuzzy yarn. This is important for a number of reasons. Dark or variegated yarn makes it extra hard to see the stitches. And fuzzy yarn is a nightmare because the stitches are hidden and it's almost impossible to frog. 5. Stitch markers are your best friend. A beginner hasn't had enough experience to recognize stitches. For example, she might confuse the turning chain as a stitch or vice versa. Explaining the difference is helpful but having her mark that turning chain or the stitch she's skipping in that place can make a world of difference. 6. Do (or at least offer to do) the first few rows for them. Let's face it: Working that first row is tough. Give your student a firm foundation before having her work her first row. 7. Teach your student to crochet with their dominant hand. I get that sometimes it's not possible. (I still haven't mastered left-hand crochet myself) If that's the case, at least help them find some photo or video tutorials using their dominant hand. I highly recommend Moogly for both hands. 8. Find a project your student can complete right away with no previous experience. This is especially important for children. Often, they can't see the payoff of learning a bunch of stitches and techniques without getting to make anything. Fortunately, there are tons of super easy projects out there. That first chain makes a great bracelet, necklace, or Barbie scarf. A simple swatch becomes a doll blanket or fingerless mitts. Adults might prefer an easy chain cowl. 9. Never say anything bad about your students' work. Ever. This should be a given but unfortunately, it's not. My mom has taught hundreds (I'm not exaggerating) of people to knit. Her policy? When they make a mistake, explain how it's not so much a mistake as it's a different stitch/technique/method. Accidentally put two stitches in the same place? Congratulations, you've learned how to increase. Added a yarnover before a single crochet? Now you know how to half double crochet! 10. Crochet is not for everyone. Although anyone can learn how to crochet, not everyone wants to. Sometimes you'll have a student who doesn't enjoy it-- and that's ok. You should let all of your students know they're free to stop if they want and you're not forcing anyone into anything. Have a teaching tip I didn't cover? Let me know in the comments! While writing this post, I came across Left in Knots' fabulous 3-part series about teaching crochet. If you're looking for even more tips (or want to make some money off of teaching) definitely check that out HERE.